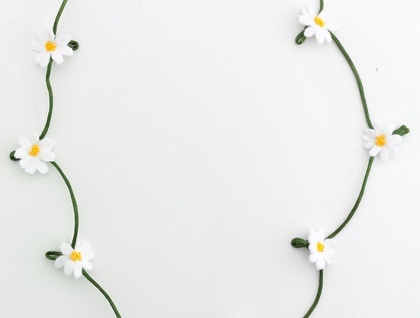 Love daisychains? Wish they could last forever ? Love summer, peace, love and rock n roll? 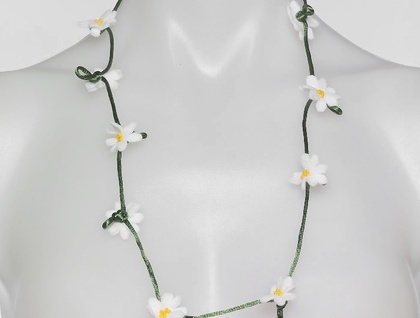 Fancy wearing flowers around your neck or in your hair? 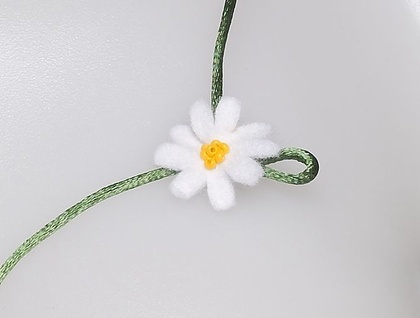 This handmade, hand stitched daisychain will never wilt and requires no water and can even be handwashed! From my " please don't mow the lawn" series of inspired handmade goodies. Each flower is hand cut from felt and then hand stitched and beaded into place, quite a time consuming exercise to get them just right!. Each necklace has a hand initialled leaf so you know your necklace is an original from Zippitydoodah! This everlasting daisy chain is the perfect way to express your inner youth, love of daisies and express your ability to find beauty everywhere. Looks great with any outfit from teeshirt & jeans to summer dresses. Can be worn around the neck or doubled over in your hair. Click on my other listings for more handmade goodness from the "please don't mow the lawn series" or visit http://wastenotwantknot.blogspot.com/ to read more about the pieces. Felt flowers, beaded centres, braided satin chain. Can be gently handwashed in tepid water, dry flat. Comes in small Organza bag.